Survivors of torture speak out: (L-R:) Bui Kim Thanh, Venerable Kim Muon, Rmah Plun, Father Nguyen Van Ly, Tran Thanh Tien, and Tran Khai Thanh Thy. Chau Hen in a safe house in Bangkok after fleeing arrest in Vietnam in 2008. ​Chau Hen, 64, a member of the Khmer Krom ethnic minority group, was imprisoned and severely tortured by police in 2010 after he returned to Vietnam from Thailand, where UNHCR had rejected his claim for refugee protection. Tran Thanh Tien was among 62 people in his village who were arrested and severely beaten by police in May 2010 for participating in a funeral procession and protest march to a cemetery located on disputed land in Da Nang. ​Police shocked him with an electric baton and beat him in his chest and arm pits from 3 pm until 10 pm. When he passed out, they threw soapy water on him. They hit him on his back with hardened plastic kitchen stools. They hung him by his handcuffed wrist from the window ledge for an entire afternoon, beating him as he hung there. After his release, when he refused to report on other villagers, police beat him again. “Before this happened to me, I never heard of any torture in police stations before this. Nobody dares to speak about it. I realized that people who are tortured by the police don’t dare speak about it. “I never imagined I’d be beaten like that. This is our tradition in burying the dead, to send them to the last place. I never expected police to crack down on a funeral procession like that. “The last words the police told me were, we know you are a farmer, you are a strong man. We guarantee that after you are released you will not be able to farm anymore. “In fact, it’s true. Since I was released I don’t feel very well. I have chest pains, back pain, coughing, and blurred vision. My ears ring and I have hearing problems. I can’t carry heavy weights any more – the police pulled my muscle when they handcuffed my hand and hung me by my wrist from the window ledge, beating me on my knee joints and groin. UPDATE: In 2012 Tran Thanh Tien resettled as a refugee to the United States, where he testified before Congress in April 2013 about police torture and abuse of people from his village in Da Nang. ​Ven. 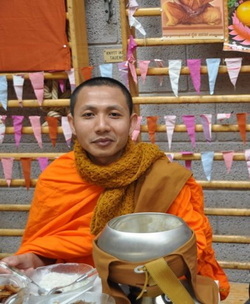 Kim Muon, a Khmer Krom Buddhist monk, was forcibly defrocked, expelled from the monkhood, and imprisoned in Soc Trang province in 2007 after participating in a protest with 200 other monks calling for religious freedom. “When you enter the interrogation room, you feel very afraid. There was a table and chair; windows but they did not open. There were two people in the room. The one who asked the questions was not the one who beat me. He would call the others in to beat me. “Every time I was interrogated, they beat me. They used a water bottle to hit me under my arms, on both sides. I must raise my arms, or they would hit me in the face. “They smashed my head against the wall. The wall had been specially made, with concrete lumps in it, for torture. “During interrogation they would use different methods if I did not confess. Sometimes they put a rug on my head to smother me. They would make me eat dog meat, which as a monk I cannot eat. Or they would put underwear on my head. They insulted and cursed me, tried to make me mad. They said I’d become a monk in order to become involved in politics. “Sometimes they took my head and pushed it into water until I was unconscious. Two people held my arms on each side and pushed my head down. UPDATE: After his release from prison in 2009, Ven. Kim Muon fled Vietnam and was resettled as a refugee in the United States, where he continues to advocate for religious freedom and cultural rights for Khmer Krom people. ​Rmah Plun, a Montagnard (Jarai) Christian from Gia Lai province, fled to Cambodia in 2004, where he was recognized as a refugee by UNHCR. In May 2005, though Plun was eligible for resettlement abroad, he decided to return to Vietnam because he missed his family. During subsequent interrogation sessions Plun was beaten in the chest, back and groin; kicked in the shins with army boots; and slapped in the face. Police also inserted writing pens between his fingers and then tied his hands tightly with a rope, squeezing his fingers and causing excruciating pain. "When I was finally allowed to return to my village and see my wife, she was shocked by how swollen and bruised my face was," Plun said. A month later, he was arrested again and tortured. He was detained for five nights in a dark cell and repeatedly pressured to renounce his religion and to provide names and locations of Montagnards in hiding. During interrogation sessions, police forced him to lie down with his hands and feet raised in the air by ropes for three hours. If he dropped his hands or feet, he was beaten. He was also hung upside down by his feet for 30 minutes at a time. After five days he was released and placed under house arrest. Police were stationed outside his house every night, he could not leave even to work on his farm, and he was not allowed to gather with others for church. 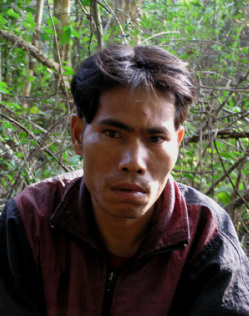 UPDATE: In December 2005 Rmah Plun fled to Cambodia a second time. In September 2006 he died in the UNHCR refugee camp in Phnom Penh at the age of 31. “In Hoa Lo, they took my medicine away. I was without my medicine for diabetes and TB for one month and four days, from October 8 until December 2009. They were fully aware of the consequences. For my diabetes I must take two pills in the morning and two in the evening. If no medicine, it can kill you. Without my medicine, I was totally exhausted. They came to my cell eight times to provide ‘ER’[critical care]—that means they gave me two paracetamol. “It was very dangerous. I was sweating profusely, my lips turned black, my arms and legs were very heavy. I felt I could die at any time. My blood pressure jumped up, and it was impossible to control my bladder. Without my medicine I had no control over urination. I had to go to the toilet dozens of times a day; sometimes I was going constantly. At times I had to pee into my rice bowl. UPDATE: In June 2011, Tran Khai Thanh Thuy resettled as a refugee to the United States, where she continues to write. ​Bui Kim Thanh was a lawyer and member of the banned Democratic Party of Vietnam who defended victims of land confiscation. She was arrested by police and involuntarily committed to mental hospitals three times, in 1995, 2006, and 2008. Her arrest and involuntary psychiatric detention in November 2006 was part of a broader government crackdown on activists prior to the visit to Vietnam of U.S. President George Bush. "They were worried I might incite or encourage the victims of land conflicts to protest when Bush came,” she said. During eight months’ stay at Central Psychiatric Hospital No. 2 in Bien Hoa, she received no therapy or counseling, but was forced to take injections three times a day. Her detention at Bien Hoa was primarily punitive in nature, she said, with virtually no therapeutic value. The only time she saw a doctor was the morning after she was admitted, for a session that lasted less than ten minutes. Later they moved her to another room, where she stayed the rest of the time.“The room was five feet by six feet—enough room for a regular iron bed, a small space to stand, and a toilet. There was no mattress or mosquito net. My family brought me a straw mat and later they were allowed to bring a mosquito net and a blanket. She was not allowed to have newspapers, books, or even paper. Her pen was confiscated at the order of the doctor. She was allowed visitors once a week, though they needed permission from police to visit and were accompanied by police the whole time. Her husband came under pressure from authorities to convince her to pledge not to continue her social activism. After four months confined to her room, her family submitted a petition requesting that she be allowed out of the room. The authorities then let her leave her room, but only at night. After her release from Bien Hoa in July 2007, Bui Kim Thanh continued her advocacy on behalf of petitioners despite being monitored and harassed by police. In August 2007 she was detained by police, who had a psychiatrist present during her interrogation. In February 2008, she was briefly detained again after she joined many other dissidents at the funeral of veteran dissident Hoang Minh Chinh. Less than two weeks later, on March 6, 2008, police arrested her, forced her into a police car, and involuntarily committed her to Bien Hoa again. Diplomatic pressure led to her release four months later. UPDATE: On July 21, 2008, Bui Kim Thanh left Vietnam and resettled in the United States. The survivor accounts above are based on interviews conducted by Sara Colm for Human Rights Watch, the Campaign to Abolish Torture in Vietnam, Boat People SOS, and Amnesty International.